On Tuesday 24th January the flamboyant Year 11 lads faced St Bernard’s Catholic School from Slough in the quarter finals of the ESFA Boys U16 Premier League Small Schools’ Cup. This prestigious national tournament is tough, but not for our lads! 125 teams entered the competition which is for schools with fewer than 65 boys in Year 11. HCC had faced this school last year in the last 16, but unluckily lost 3-1, knocking them out of the competition. Before the match the team spirits were high. 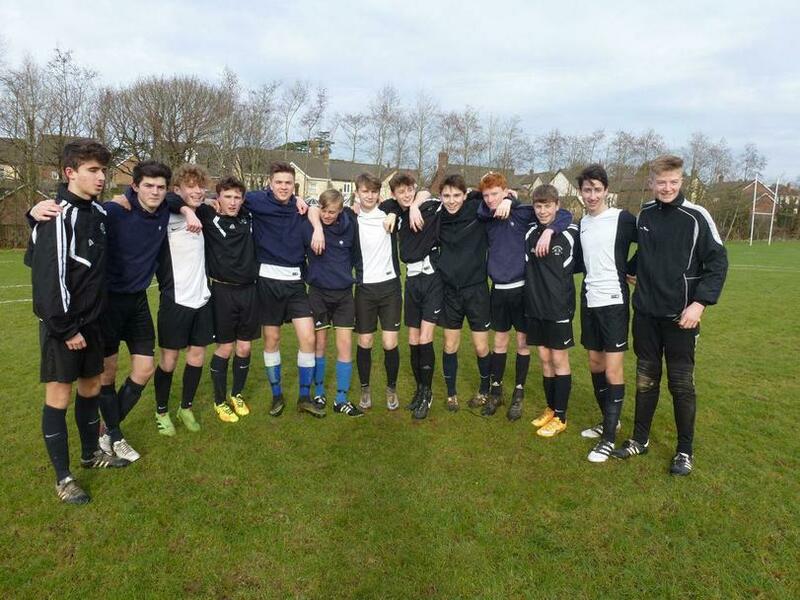 We have done lots of training outside of school; most of us play for Holsworthy and we have played football together since we were about 10! The first 20 minutes or so of the match were tense, but then things changed! Max McDonald played a weighted ball over the top to Will Harris who smashed it into the top corner. The crowd went wild! 1-0 to Holsworthy! Jay Thomas then capitalised on an opportunity to roll the ball into the bottom corner from about 20 yards out – 2-0 to HCC! 5 minutes later Max was brought down just outside the box as the game was starting to get heated. Ben Furber then calmly placed the ball into the top corner from the free kick. 3-0 HCC! Another short period later HCC won another free kick 35 yards away from the goal. Jay Thomas then rifled this one in – 4-0 HCC! Half time approached and the boys were buzzing. A team talk at half time with Mr Vanstone made the boys realise that although the game looked like it had been won, it was far from over. As they started the second half, HCC were confident, but not complacent. Defending solidly from numerous St Bernard’s attacks, John Skinner and Joel Greening remained composed and kept the ball away from the HCC goal. Halfway into the second half a long ball reached Ben Furber and he knocked it over the keeper. 5-0 HCC! The game was again getting heated, but HCC remained in control with strong challenges from Kieran Langman and Josh Down. With 5 minutes remaining Olti Arriki finished powerfully into the bottom corner, leaving the St Bernard’s team disappointed. 6-0 to HCC on the final whistle. HCC will now go into the semi-finals, which could see them travelling some distance if the next match is away.